The department of Licensing And Regulatory Affairs (LARA) issued new emergency rules through the Bureau of Medical Marihuana Regulations (BMMR), that will help ensure medical marihuana patients will continue to have safe access to their medicine. The previous emergency rules would have required all currently operating medical marihuana facilities to close and cease operations if they had not received a state license by June 15 2018. This has been a concern for many patients and caregivers across the state as the BMMR and the Medical Marihuana Licensing Board (MMLB) have yet to approve any state licenses. It certainly seemed that without new emergency rules or some other intervention, medical marihuana patients and caregivers that rely on provisioning centers would be left without safe access to their much needed medicine. Luckily, Governor Snyder signed the new emergency rules which amends Rule 19 and now extends the deadline for licensure approval to September 15th. Rule 19 now allows for those provisioning centers that were currently operating and had sent in MMFLA applications to the BMMR by February 15th to remain operating temporarily until either they are denied a license or September 15th of 2018. There is still some concern regarding temporary operation, as some board members have made statements about the legality of those who have previously operated without a license, and LARA in the press release announcing the new deadline for temporary operation stated, “Ultimately, licensure decisions will be made by the members of the MMLB, who may choose to consider unlicensed activity as part of the licensing criteria when deliberating on the overall application. Until a license is received from the state, the operation of a proposed medical marihuana facility should be considered a business risk by the operator”. While the new emergency rules are good news for patients and those currently operating, it does little to speed up the licensing process and there is still no guarantee that any licenses will be issued by September 15th. 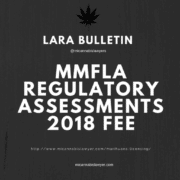 Even if some licenses are issued, will there be enough licenses issued by the MMLB to cover patients and caregivers in each of the 63 municipalities that have opted into allowing provisioning centers under the MMFLA? It appears that LARA is working hard to accommodate patients by extending the deadline but isn’t taking the necessary steps to speed up the application process. If you have any questions involving the application process under the MMFLA or any recent announcements by the BMMR please call the Michigan Cannabis Lawyers at the Covert Law Firm at 517-512-8364. Thank u for all u do on our behalf Josh! Driving Under the Influence of Marijuana In Michigan Is Cannabidiol (CBD) Marijuana?